Womens weight lifting gloves are a necessity for blister prevention. 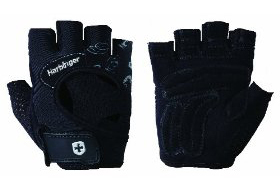 Harbinger weight lifting gloves aid in preventing hands calluse and blisters. They are excellent workout gloves. Weight training for women has become much more accepted than it was 20 years ago. Nowadays, you see just as many women in the gym as you do men. It doesn't take long, however, for women to realize they need to take care of preventing blisters or the formation of thick calluses on the pads of their hands. Comfortable and durable workout gloves are a must for getting the most out of your weight training session, and being able to enjoy doing it. If you dread coming to the gym, or lifting at home because of forming calluses, you will quickly drop out of this important component in your overall fitness plan. Harbinger Womens Weight Lifting Gloves provide an excellent Anti-Microbial FlexFit model that ladies find appealing. They are made out of an anti-microbial Lycra that eliminates bacterial growth and reduces perspiration odor. * Velcro closure to tighten or loosen as needed. Also, this makes it so you do not have to spend frustrating time peeling them off at the end of your workout. In our opinion, Harbinger Womens Anti-Microbial FlexFit Weight Lifting Gloves are the best available.